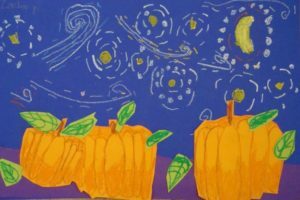 The Drawing and Mixed Media class finished Pumpkins Starry Night. We looked at Van Gogh’s Starry Night painting and students drew stars, moon, and star movement with oil pastels. 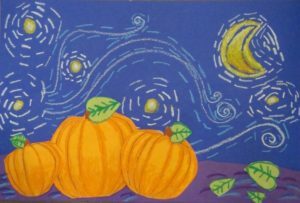 They added pumpkins in orange paper and oil pastel.